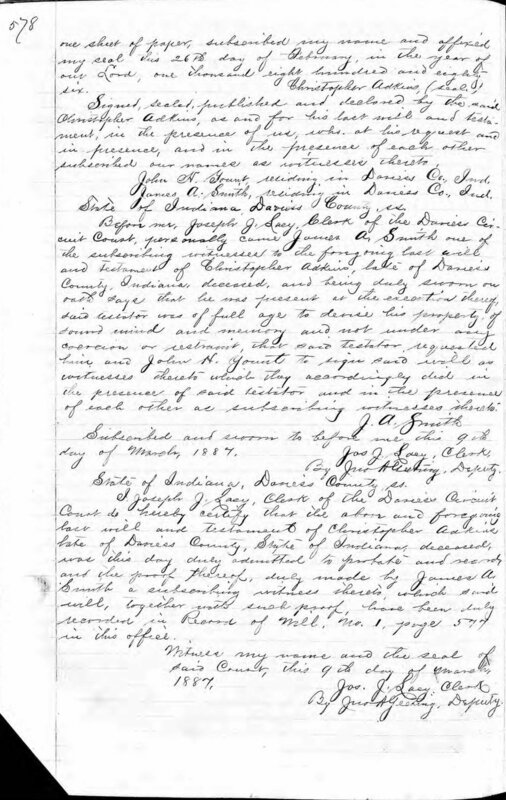 I believe this to be the Last Will and Testament of my 4th great grandfather, Christopher Adkins (1825-1887). He was born in Whitley, Kentucky and died in Daviess County, Indiana. 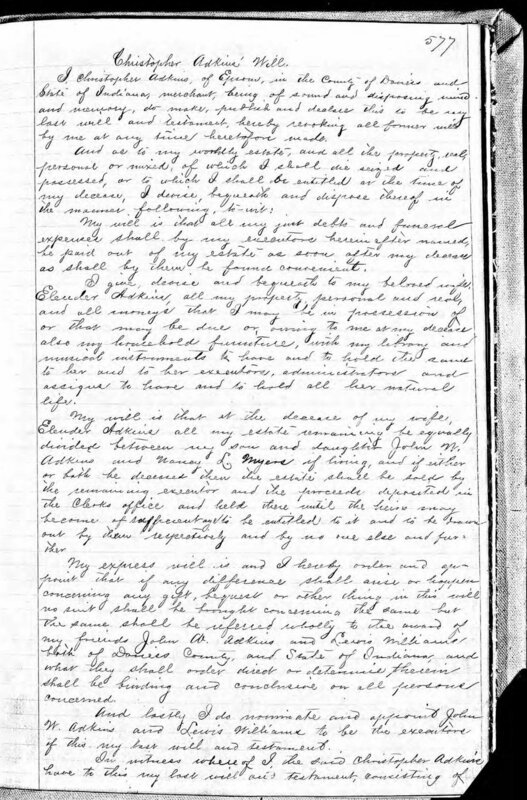 It appears to be a transcribed copy of his official Will, registered after his death. “I Christopher Adkins, of Epsom, in the County of Daviess, and State of Indiana, merchant, being of sound and disposing mind and memory, do make, publish, and declare this to be my last will and testament, hereby revoking all former wills by me at any time heretofore made. Christopher basically leaves everything to his wife, my 4th great grandmother. I believe her to be Eleanor Lee Adkins (1830-1894), although the name looks slightly different in the document. In the event of his wife’s death, Christopher leave his estate to his two children: John W. Adkins (1852-1887), my 4th great uncle; and Nancy L. Adkins Myers (1850-1922), my 3rd great grandmother. He specifically mentions that his “household furniture, with my library and musical instruments” shall be given to his wife or her executors should she be deceased. In the event that all of his heirs are deceased Christopher appoints two of his friends, John A. Adkins and Lewis Williams as his executors. It is a little unclear if there are one or two people named John Adkins in this Will (one with an “A” as a middle initial and the other a “W”). The second page of Christopher’s will appears to be some legalese certifying the authenticity of the Will. Christopher’s daughter, Nancy, married Joseph Myers (1842-1900), my 3rd great grandfather. Joseph and Nancy had a son, Oliver Myers (1873-1935), who married and had a child with Clara Miles (1875-1934). Oliver and Clara were my 2nd great grandparents. Oliver and Clara had my great grand-father Arthur Bryan Myers (1900-1964). It is not clear how long Oliver and Clara were together. Clara, as some of you might know, went on to marry a John Alfred Sears (1861-1951), who would have been Arthur's step father. Arthur, who took the Sears name as a child, went on to marry Ida Rhoads Sears (1900-2002). Here is a chart of what all this looks like. As far as Wills go, this one seems fairly basic and straightforward. The neatest detail was the special mention of Christopher’s library and musical instruments. I would love to know what those were. Wills are wonderful for genealogy research. If you are lucky enough to find one you will likely be rewarded with many answers (and a few questions) regarding your family history. As I think about Christopher Adkins and his Will, here are some of the questions that I have. Christopher was a “merchant”. What did he sell? What sort of books did Christopher read and what sort of music did he play? Are there one or two John Adkins mentioned in his will? If two, who is the second (assuming the first is his son)? What do you think, feel, and wonder about as you read some of these details about Christopher’s life? What discoveries have you made from Wills that you have found in your family history research? I would love to hear from you about any of these questions or details. This is the 44th of 52 weekly posts planned for 2018. It was inspired by the #52Ancestors writing challenge issued by professional genealogist, Amy Crow Johnson. The challenge: once a week, for all 52 weeks of the year, write about a relative in your family tree.